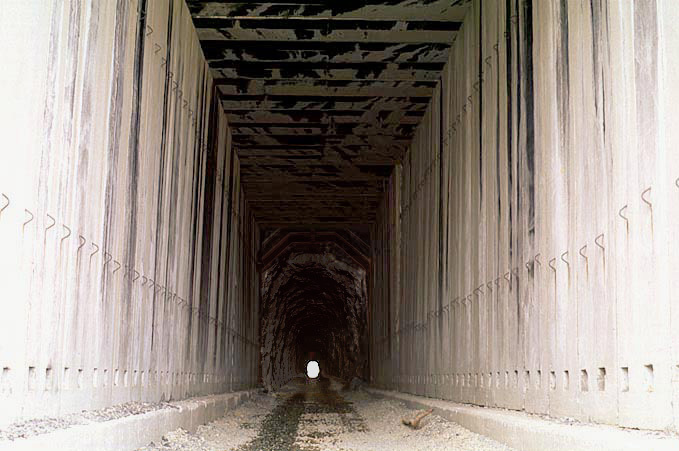 TUNNELS OF THE PACIFIC RAILROAD. Van Nostrand's Eclectic Engineering Magazine, Vol. II, 1870 pp. 418-423. 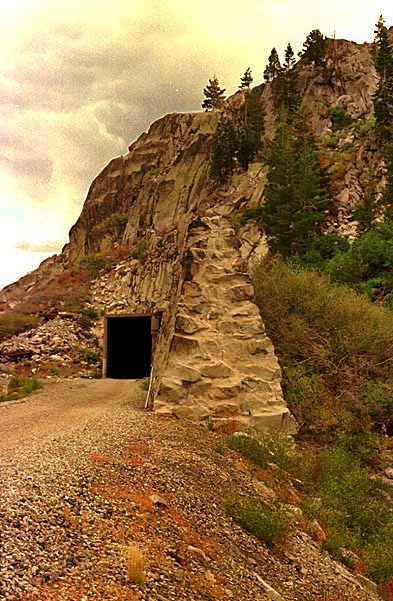 Opened on November 30, 1867, after two years of blasting, the 1,659 foot long Summit Tunnel (#6) at Donner Pass was used continuously for 130 years by the trains of the Central Pacific, Southern Pacific, Union Pacific, and AMTRAK. It is now bypassed and sits idle. 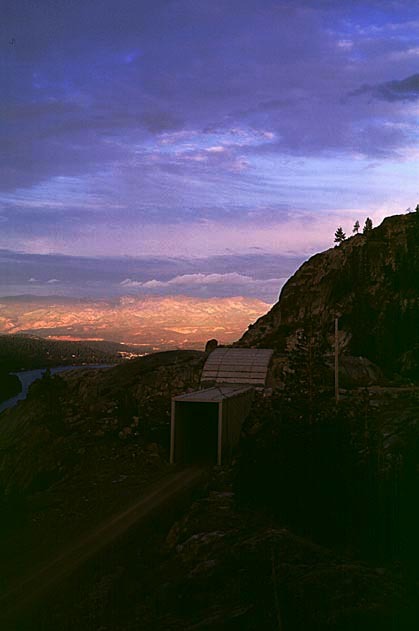 Here we are looking back through a modern concrete snow shed (Tunnel #7) with the Summit Tunnel just beyond. 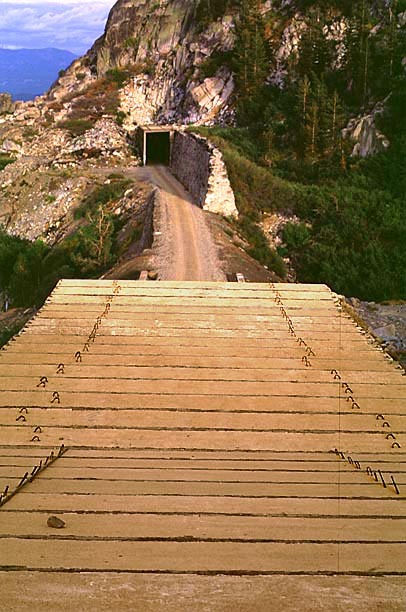 An overpass near the west portal of the Summit Tunnel carries a road over the now-abandoned line. 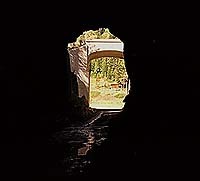 Looking through the tunnel from the end with the snow shed. You can just see the glow of sunlight from the other end. 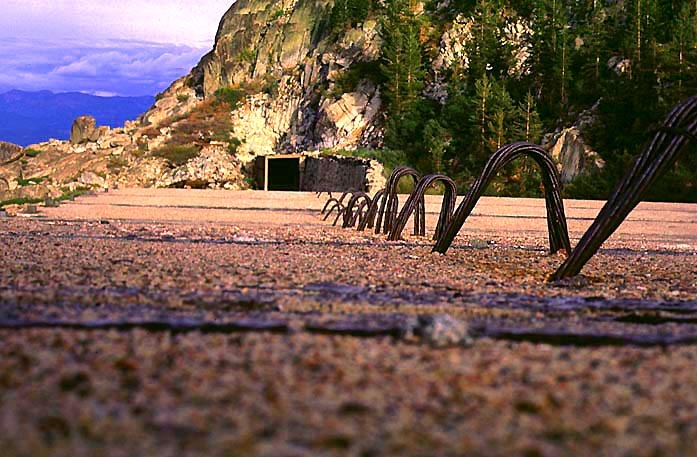 The snow shed was built much later, out of cement. 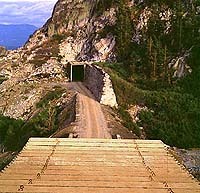 This snow shed is immediately east of the Summit Tunnel and is the snow shed we're looking through in the first shot of Tunnel #6 above. 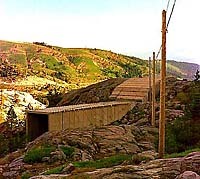 Originally a tunnel (#7), the SP removed its top at some point only to discover that it needed to be covered again to keep the tracks clear of snow. 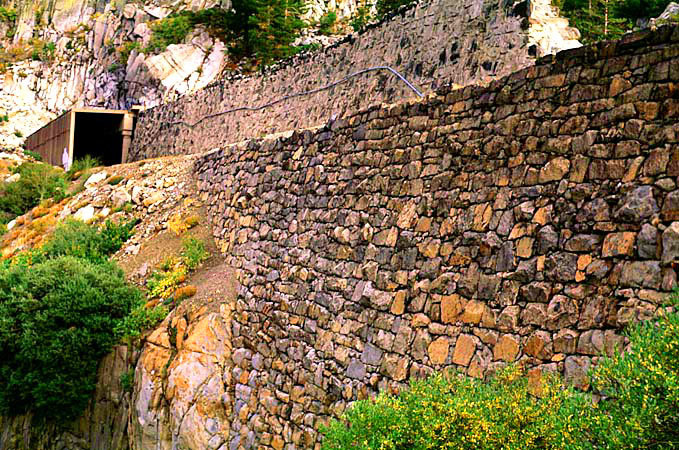 The 75-foot high lower “Chinese Wall” supports the grade built to fill the ravine between Tunnels #7 and #8. 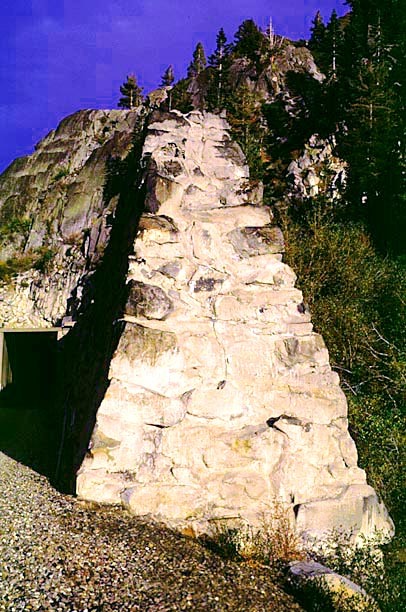 You can also see the upper wall supporting the embankment above the entrance to tunnel #8. 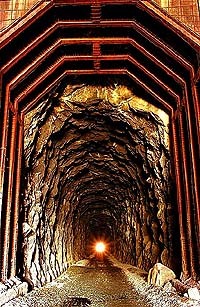 The tunnels and walls were built with Chinese labor, as was most of the CPRR. 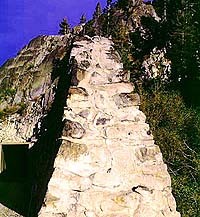 Another shot of the Chinese walls. G.J. Graves reports that he scurried all over the China Wall between Tunnel 7 and Tunnel 8, and found, with the exception of just six stones that show chisel marks, not a single stone had quarry holes nor blast holes nor any signs of being worked, concluding that these stones were just rubble from Tunnel 7, picked up by human beings and placed in a gravity wall. 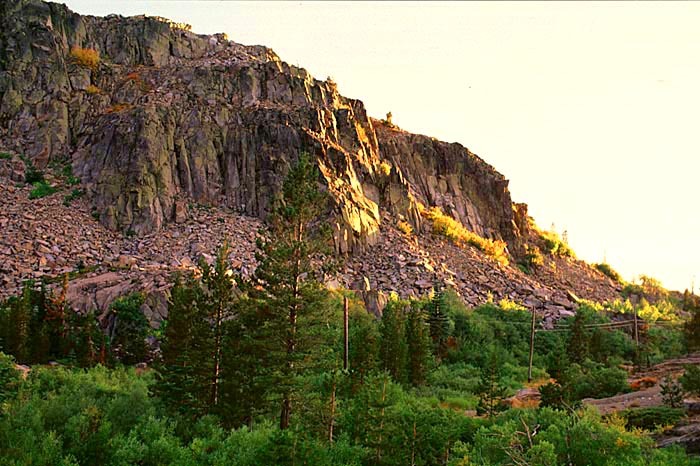 He quotes Charles K. Graydon, author of "To Donner Pass from the Pacific" stating that: "The stone retaining wall, built by Chinese railroad workers to support the SPRR (CPRR) tracks, blocks the final gap used by the emigrants to reach the summit." 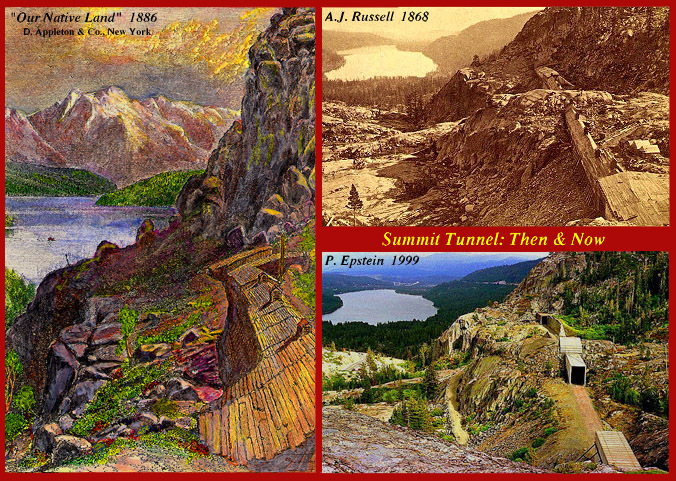 The emigrants he speaks of are the folks that used Donner Pass to enter California, the "summit" is Donner Summit. 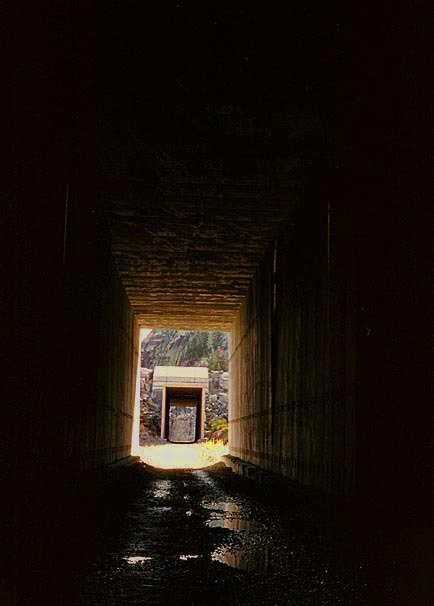 This photograph was taken standing on top of the snow shed (Tunnel #7) looking back (west) at the Summit Tunnel. You can see another snow shed at the entrance to the tunnel. 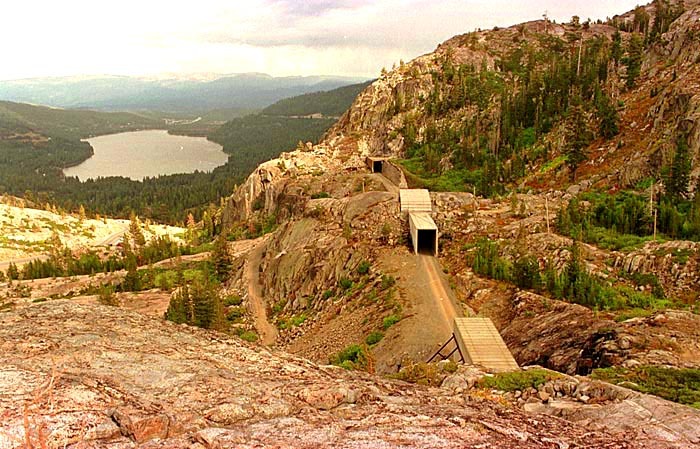 View from on top of the snow shed (Tunnel #7) looking down at Donner Lake. 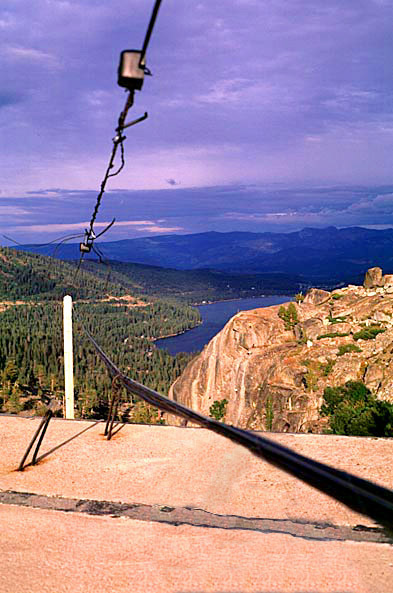 Utility lines cross Donner Pass right here. Nuts and plates hold the snow shed together. The roof of the snow shed is made of segments, each with 4 loops used to lift it into place. 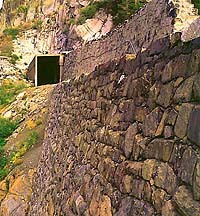 The view looking east of the upper “Chinese Wall” and Tunnel #8 from up top. 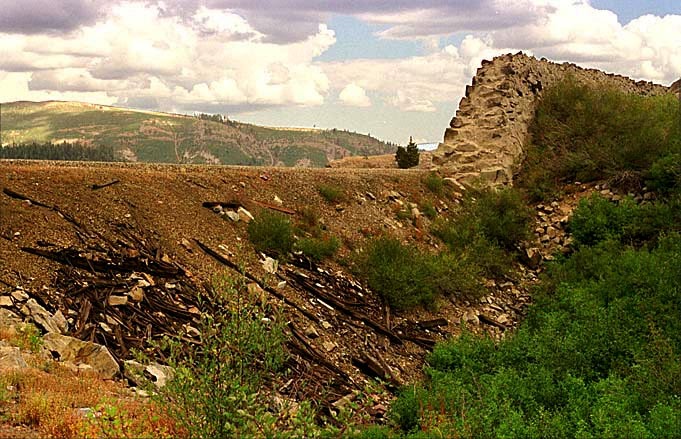 A closer look at the upper Chinese wall. 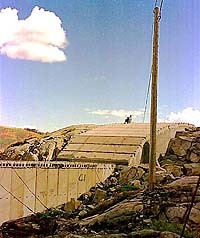 Supports for the snow shed on the end of the Summit Tunnel. The sun is starting to get low in the sky. 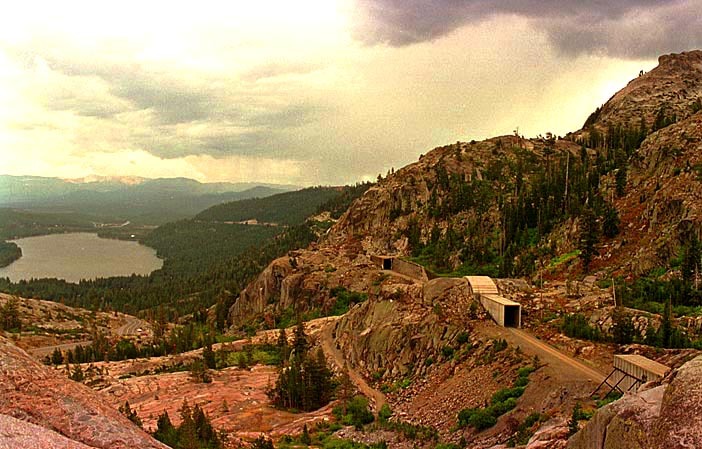 Here is Donner Pass. 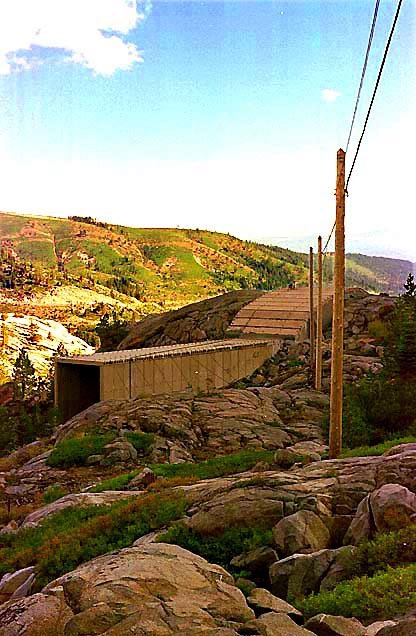 You can see the utility lines going over the pass. 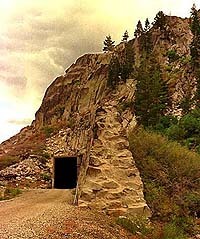 This is right next to the Summit Tunnel. 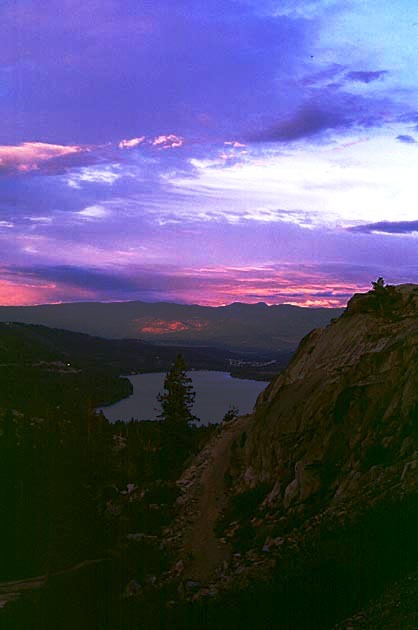 Sun sets on Donner Lake. 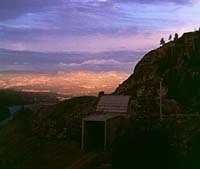 Another shot of the Summit Tunnel taken from the end with the snow shed. 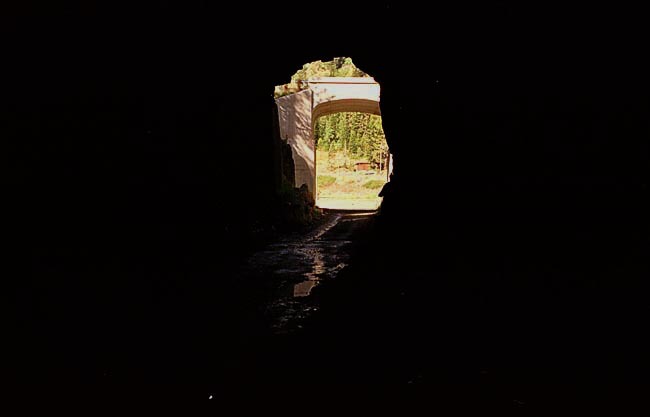 Looking out of the west portal of the Summit Tunnel. You can see the roadway overpass just outside. 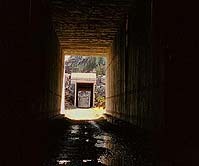 Looking out the other end of the Summit Tunnel. Looking in from the end. 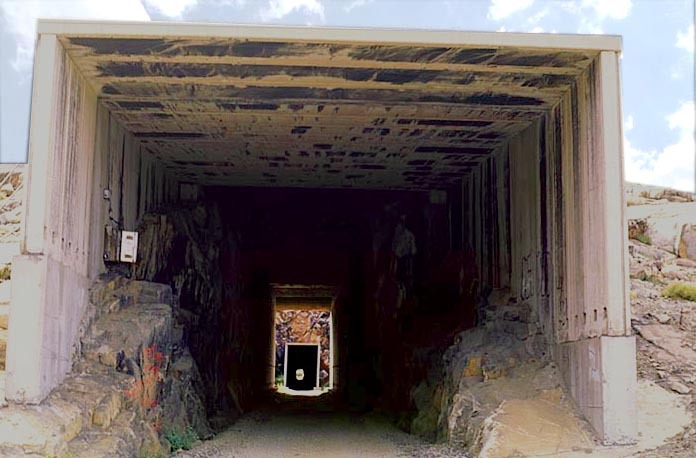 You can see the truck's headlights and other bright lights inside the tunnel. Utility line running from the pass over the rail line. 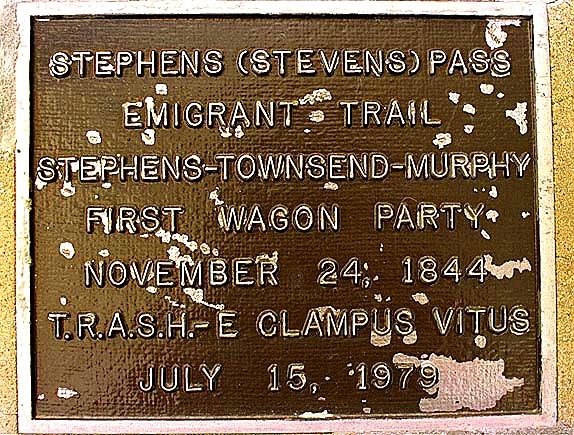 A plaque explaining that this is the pass taken by early wagon trains as people first settled here in California. 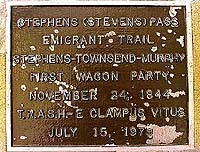 The pass was named Stephen's Pass. 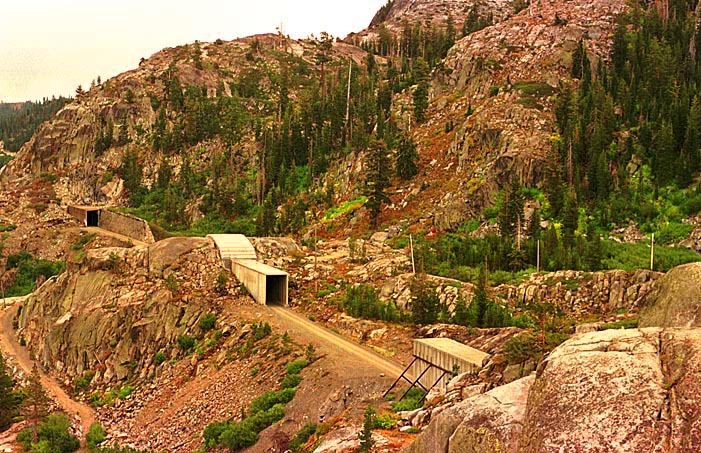 When the Donner party was largely wiped out and those who survived resorted to cannibalism to stay alive, the pass was apparently renamed, as it is referred to as Donner Pass today. 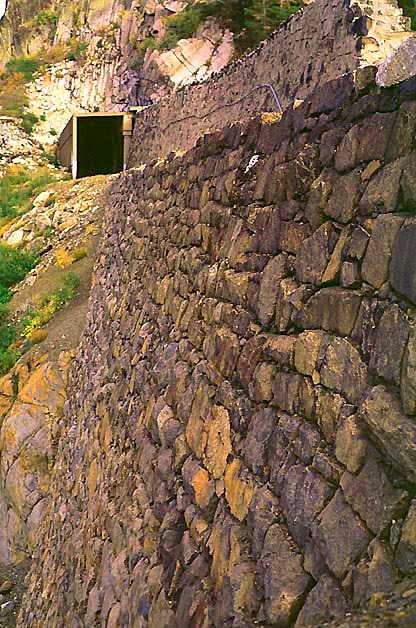 A view of the back of the upper Chinese wall. You can also see the small tunnel under the rail line. 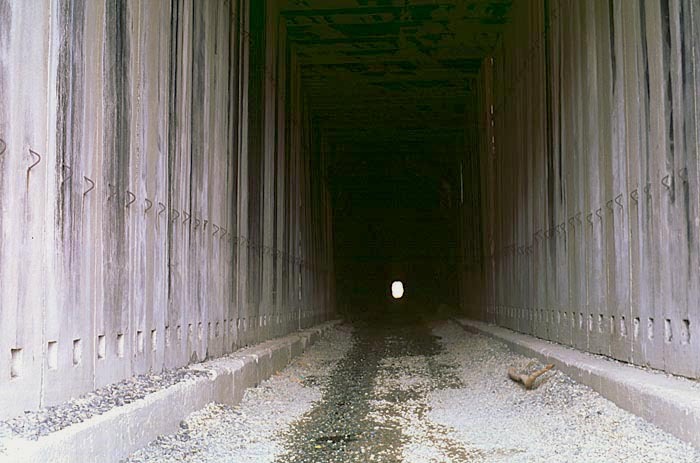 Jack Duncan, author of a book on old Highway 40, comments that the road in the underpass began use in 1914, the grade crossing prior to the underpass completion was still in use in October, 1913. 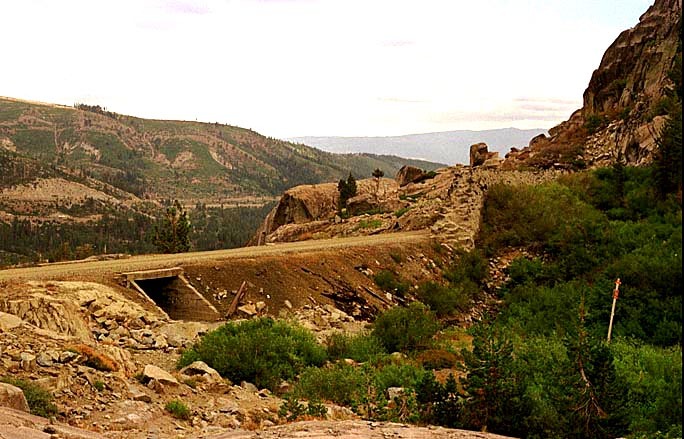 The road in 1914 was the Lincoln Highway until 1926, when it replaced by the current Donner Summit Bridge in 1926, in 1928 that new road was named Highway 40. No railroad ever used this underpass. 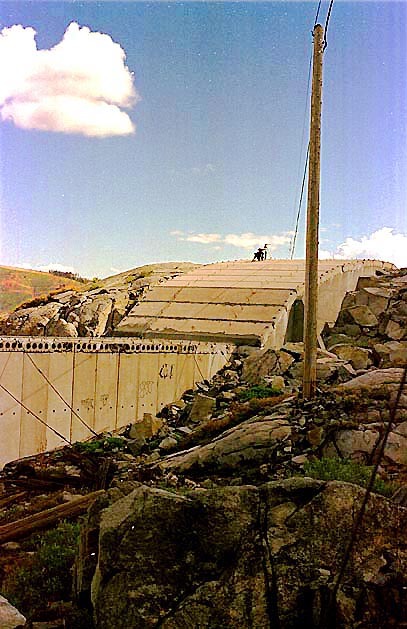 G. J. Graves explains that the old highway (prior to Highway 40 and the Victory Highway) was known as the Donner Pass Road and that prior to the underpass, it ran over the grade. 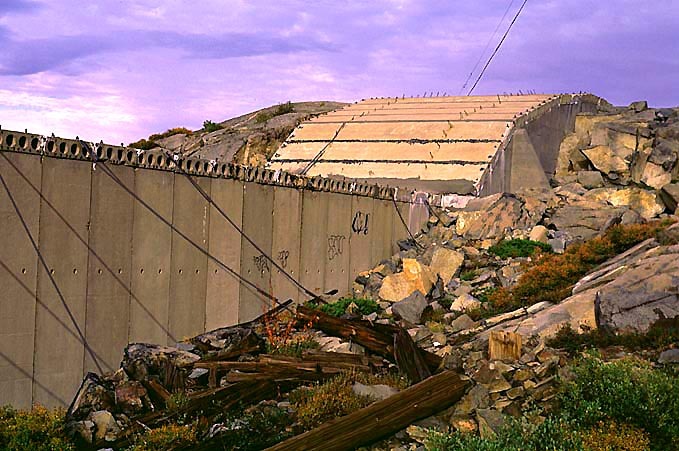 A closer look at the back of the upper Chinese wall. 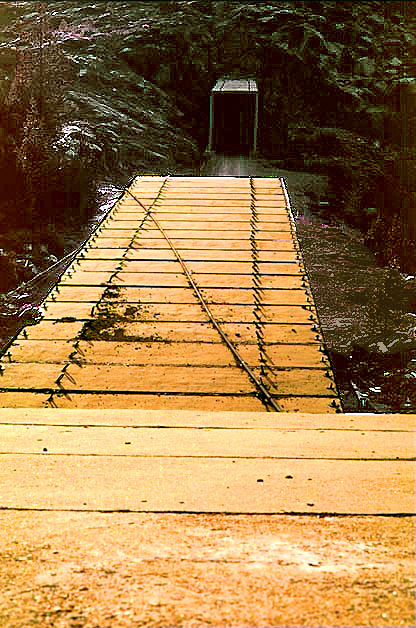 The upper Chinese wall, end on. 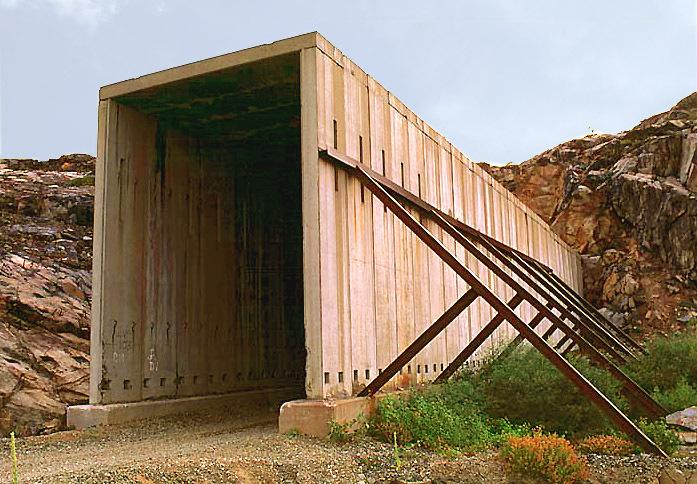 A square shaft extends down to the middle of Summit Tunnel which was used during construction when four faces were being blasted at once — one from each end and two from the inside out. 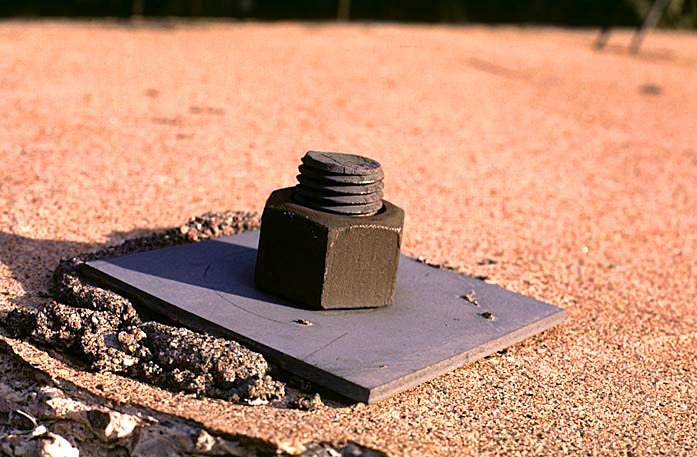 It is now capped by a heavy plate supported by rows of welded rail. Around this plate is a strange substance which has a springy feel when stepped on. I don't know why it was put there or what it is. Very strange. There is no way to see down the shaft, but you can see up it from below. Taken from a little hill across the road from the top of the shaft. You can't see the top of the shaft, but it's around the middle of the frame. develop it, all in a 5 minute window. Pretty amazing! Climbing around a bit from the top of the shaft, you reach several spots with wonderful views. 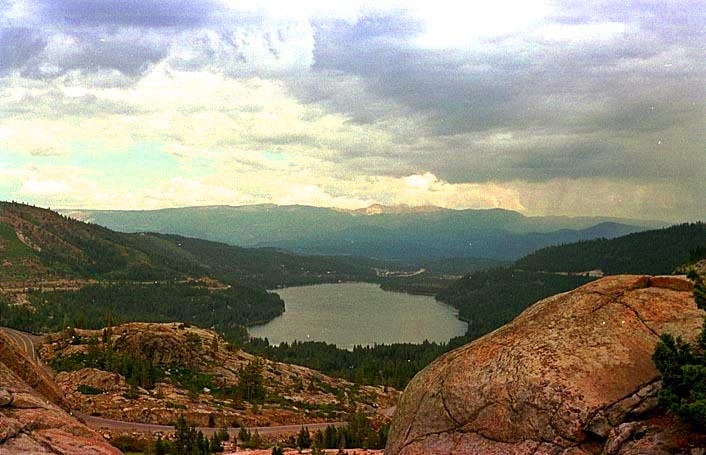 Here is Donner Lake from one such view. 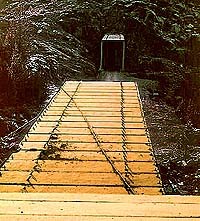 Here you can see Summit Tunnel (#6), Tunnel #7 (now a snow shed), the “Chinese Walls,” and the western portal of Tunnel #8. 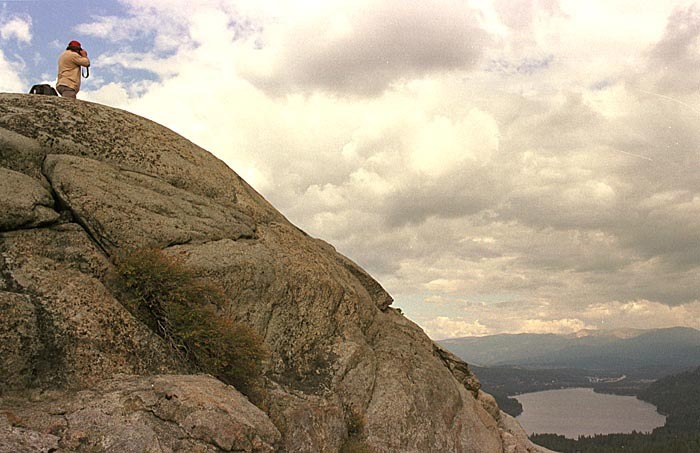 As above, but from a different perspective, with Donner Lake on the left. Shooting from way up high. 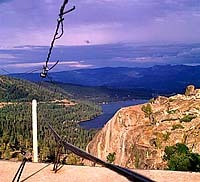 You can see Donner Lake far below. 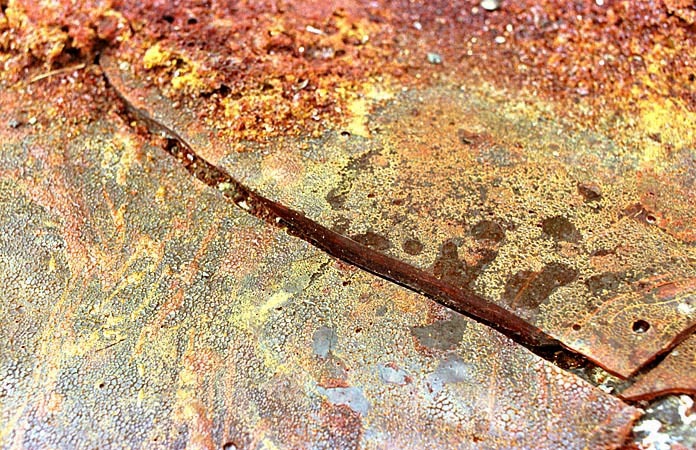 Modern photos Copyright © 1999, Peter Epstein. Courtesy Peter Epstein, Photographer. Used by permission. 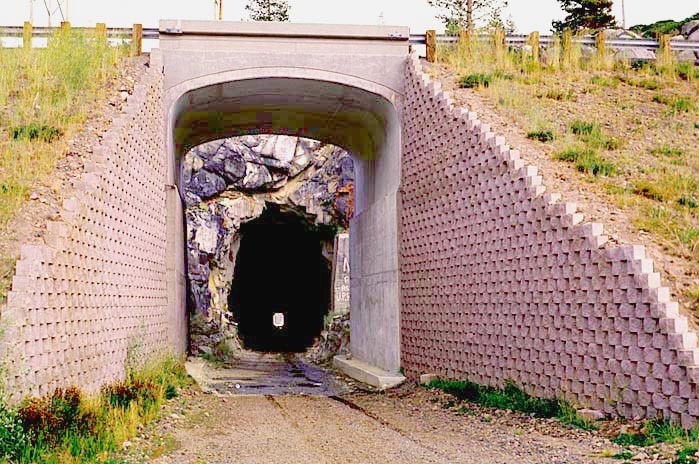 Adapted from Peter Epstein's Donner Pass Train Tunnel web page. 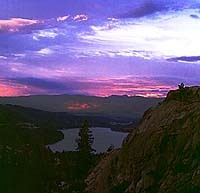 ... 30Lake.jpg has the caption "Sun sets on Donner Lake". 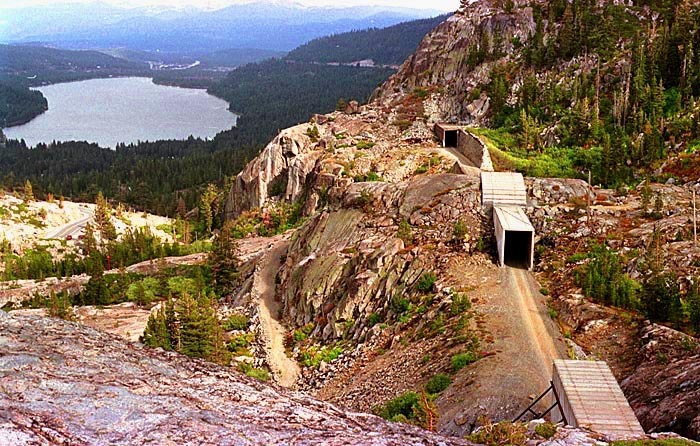 The picture appears to be taken from atop the Summit Tunnel (#6) western portal shed looking down on the Old Donner Summit Road just to the north of the underpass with Donner Lake beyond. 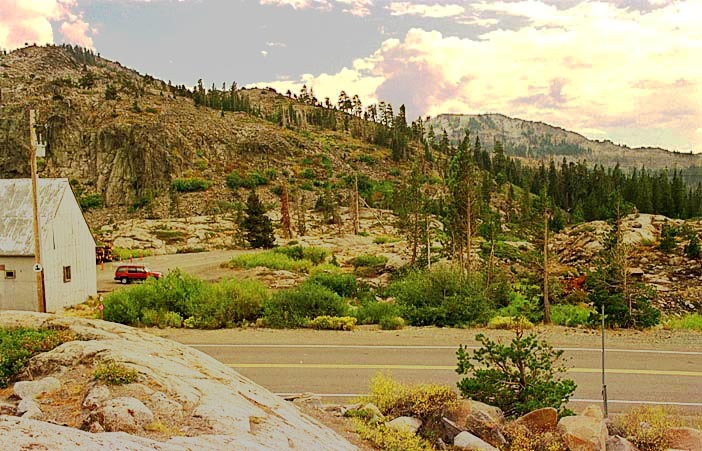 That's looking eastbound so the caption should read "Sunrise on Donner Lake" (unless my astronomy is wrong).